Ambitious photo essay looks to gather 100,000 photos in support of human rights and equality around the world. I AM EQUAL photos capture the individual's passion for their cause - whatever that may be. Salt Lake City, UT , June 29, 2010 /PN/ If a picture is worth 1,000 words than you can bet 100,000 pictures can say a lot; at least that’s the theory behind an ambitious photo project from international photographer Matt Spencer who is setting out to change the world from behind his camera. “Pictures are such simple things. We think very little about them but they are everywhere around us,” comments Spencer, “What if pictures were more than something beautiful to look at, what if they actually made a statement?” And that is what he is setting out to do with his I AM EQUAL 100,000 PHOTO WORLD TOUR – an unprecedented 5-year project to capture the passion, purpose, and vision of people from all walks of life as they stand up for human rights and equality. Each picture takes less than two minutes to shoot after the participant is registered through the process and requires nothing more than a temporary tattoo on the palm and a genuine desire by the individual to make a change in the world. “We don’t tell a person what their cause is, that’s up to them individually,” explains Spencer during a small photo event in Salt Lake City, Utah. “I had a women in here about an hour ago who was nearly in tears as she explained her passion for ending female genital mutilation. For her, this picture is a way to show here support for this issue and invite others to join her in this cause. The tour is set to launch officially in July of 2010 in Salt Lake City and then quickly move on to Los Angeles, Chicago, Orlando, and Seattle before crossing international waters into Europe. “This is an adventure, no doubt about it,” says Beckett of the 5-year commitment. “but I can think of nothing I’d rather be doing with my time than creating a forum for these important conversations to be taking place. 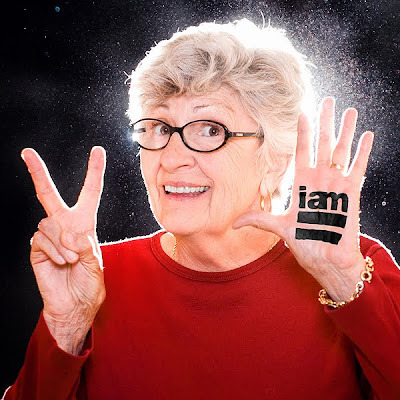 The I AM EQUAL project was created by Jason Beckett and photographer Matt Spencer in 2010. For information about the tour events and schedule visit http://www.iamequal.com. The site includes a photo gallery of the pictures, event sponsors, as well as a blog featuring articles and stories about the pictures and participants. looking forward to see what big names this campaign will attract.